The decision to choose between a French Bulldog and a Boston Terrier can be a tough one. However, understanding the similarities and differences could help you find the one that fits your needs. While these two breeds are related historically and genetically, they also have significant differences. French Bulldogs and Boston Terriers are medium built and share a flat, pug-like face. They also trace their origin to the English Bulldog. Here are more similarities that the two breeds share. They are playful and friendly to strangers. They are not too complicated to train. They are fairly easy to groom. They are susceptible to drooling and flatulence. They are great companions. French Bulldogs, specifically, are easy to take on a walk and love being cuddled. They are highly adaptable to various living spaces. They possess a low prey drive. They do best in climate-controlled environments. Below is how the different breeds compare on various aspects. The Boston terrier resulted from a crossbreed between the now extinct White English Terrier and English Bulldogs. It dates back to the last quarter of the 19th century. The breed was known as American Bull Terrier then. Due to objections to the name of the then-new breed, by some Bulldog and Bull Terrier fanciers, the breed name was changed to Boston Terrier in 1891. More breeding was carried out in the early 20th century to standardize the breed to what is today’s Boston Terrier. The history of the French Bulldog dates to the mid-19th century when the lacemakers from Nottingham, England resettled in France. The English Bulldogs accompanied these workers and later interbreed with several small France-based breeds to create what is today’s French Bulldogs. Both Boston Terriers and French Bulldogs are relatively small dogs with a similar size, but Boston Terriers are leggier while the Frenchies have a large bone structure and are more muscular. The slightly longer legs at approximately 36-41 cm give Bosties a slight height advantage over the Frenchies whose height is 30-33 cm tall. The lack of vertical height in French Bulldogs is compensated with weight. They weigh between 20 and 30 pounds while Boston Terriers weigh between 15 and 25 pounds. French Bulldogs come in a variety of colors such as Pied, Brindle, and Fawn. Boston Terriers, on the other hand, feature tuxedo-style markings in black, seal, or brindle with white. Besides colors, Frenchies are famous for their bat-like ears that stand erect above the square-shaped head. Boston Terriers also have pointed ears. Bosties have wide noses that are well defined and black. 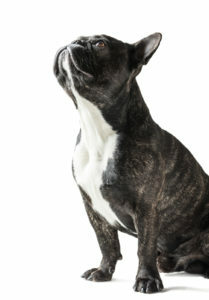 Likewise, Frenchies possess extremely short and wider nostrils with a distinctive line between the nostrils. For this reason, these two breeds are brachycephalic and, therefore, susceptible to health and breathing problems. Among the two, French Bulldogs have a bigger square head when seen from the front side. Large, in this case, as in relation with the rest of the body. While Bosties heads are also square, they are flat on the top and wrinkle-free. While both breeds have a moderate level of activity, Bosties are generally more active and energetic than Frenchies. They love activities such as jumping, running, and fetching. They can get obsessed over a tennis ball. Therefore, they make good running partners, but they can easily overheat, especially if you are running out in the sun. Due to their muscular build, the Frenchies are more relaxed. This doesn’t mean they are less playful. Moderate exercise such as long walks suit French Bulldogs. Frenchies love spending time with adults and children. They are generally friendly towards other dogs and strangers. The Bosties are extremely friendly dogs who love staying with people, especially kids. In fact, they are slightly more kid-friendly than French Bulldogs. You won’t have a problem introducing the dog to strangers. Since both of the breeds need only moderate exercise, they can adapt easily to an urban setting. Due to their less energetic nature, Frenchies can suit apartment living. French Bulldogs are generally house dogs, so they should not be left outdoors for a long period of time, especially during harsh weather. While these dogs can adapt well to new owners, they don’t like to stay alone. By contrast, Boston Terriers can adapt easily to different living spaces. Although they don’t like to be left alone, they can tolerate staying at home alone. They also tolerate extreme weather better than Frenchies. Moderate exercise can keep French Bulldogs healthy. Common problems include intervertebral disc disease, elongated soft palate, allergies, brachycephalic syndrome, hip dysplasia, and von Willebrand’s disease. While Boston Terriers tend to have good health, they are also susceptible to specific health conditions such as corneal ulcers, von Willebrand’s disease, hip dysplasia, deafness, cataracts, allergies, and cherry eye. That is why it is important to seek clearance and medical history of parents of these breeds. While not a health concern, you should be warned that these breeds are known to be loud snorers, Frenchies being a bit noisier! Boston Terriers are not heavy shedders, so they are easy to groom. They are vulnerable to weight problems, but not as much as French Bulldogs. Besides this, they are light droolers. Frenchies are moderate shedders, not too heavy but not too light either. Similar to Boston Terriers, they don’t drool too much unless they are panting. They need moderate exercise to keep their weight under check. Generally, French Bulldogs are easier to train and housebreak – although they can be stubborn. Likewise, Boston Terriers, who tend to be intelligent, are easy to teach new tricks. However, their intelligence can make them quite stubborn to follow instructions. That is why you have to persist to show them you are in control. They can also get territorial, so it is important to introduce them to people and other dogs at an early age. Both breeds will alert you when they sense an intruder entering the house. However, Boston Terriers tend to bark and howl more than Frenchies, which can be annoying sometimes. While they bark less, Frenchies tend to be proactive in protecting people they love. Terries are less aggressive in offering such support. While both breeds are quite similar in many aspects, they have their differences. French Bulldogs are one of the best companions to keep while Boston Terriers are more active and trainable. Both breeds are prone to specific diseases, so it is important to source them from reputable breeders who will share with you the medical histories of the parents. Generally, both breeds are a great investment for new owners; it all depends on what you are looking for in a dog and your lifestyle. Still can’t decide between the two? Attend breed-specific meetups, which normally host several dogs, to get a sense about how each dog behaves. Alternatively, if you know a friend with a French Bulldog or a Boston Terrier, ask them to allow you to spend time with these dogs and get to know them!